Information about Antique and Old Fishing Lure maker Riley Haskell his history, and his minnow is sparse and sporadic at best. Lure Maker Riley was born March 3rd 1827, in Geauga County Ohio, in 1841 Geauga County was renamed Lake County. Riley's parents Foster Haskell who was a carpenter, was originally from New York, he was born December 5th 1799 - Died May 21st 1873. Riley Haskell's mother Poly Lang Huntoon from New Hampshire born August 23rd 1807- Died March 18th 1875. Riley Haskell was never married and was the eldest of six siblings Conelia Lydia Haskell (March 7th 1829 - Nov. 10th 1911), William Haskell (November 28th 1830 - September 21st 1912), George Haskell (September 19th 1832 - April 18th 1854), Emily Ann Haskell (September 17th 1840 - November 23rd 1921), Albert Haskell (July 9th 1843 - August 27th 1912), and James Haskell born about 1844. 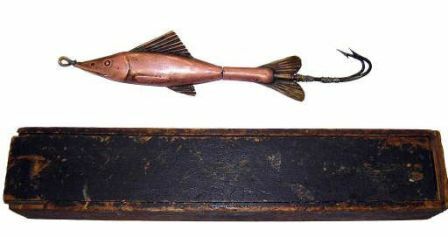 Growing up in rural north east Ohio in the early mid 19th century, Painesville on the shores of Lake Erie would give a hint to how or why this antique lure and minnow maker got his start. As fishing and or lure making was more than a sport but a way and means of survival in the early days, one can only imagine what the hopes and dreams of a young Riley Haskell were. I have found no information on anything other than census data for Riley or his family prior to the late 1850's. While most lure collectors would tend to look at Painesville as having only one link to any historical provenance, the now famous Riley Haskell Minnow. The surrounding areas of Mentor and Painesville are filled with a rich since of historical pride. One can only wonder if in 1861 when President Elect Abraham Lincoln stopped by Painesville by train for a speech on his way to be inaugurated, if Riley Haskell may have been in attendance. If he was there, what effect would having seen such a great common man on his way to influence the United States and the World, and being a impeccably simple, and honest orator have had on Riley, his life, or his business. Painesville notably, is also considered home to the late President Garfield. 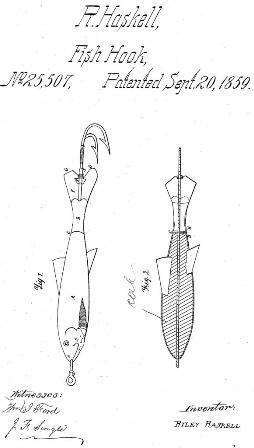 As with most early manufacturers of antique fishing lures, Riley didn't make his initial step right into being a lure entrepreneur. Riley was first noted as a gunsmith, both manufacturing and repairing. I personally believe this is a key factor in the scarcity Riley Haskell's lures or a contributing factor. Placing time dates and a historical timeline next to Haskell's life, his business an what has been published or found referencing Riley Haskell can and does lead certainly to some speculation. But, it is my guess that Riley decided to lean more towards rifle making and repairing than making the minnow as it was more profitable especially since the Civil War was going on.